Ailanthus Webworm (Atteva aurea) caterpillars feed exclusively on the non-native, highly invasive, misleadingly named Tree of Heaven (Ailanthus altissima, family Simaroubaceae). I came across a heavy webworm population this week while lumbering through a thick growth of tree of heaven saplings in search of Spotted Lanternfly (Lycorma delicatula). Of course, spotted lanternfly has not been found in Ohio. However, since tree of heaven is the primary host of this potentially invasive non-native pest, I'm checking these odoriferous trees every chance I get even if it means risking life-and-limb stumbling among close-grouped stems (see BYGL Alert, "Be Alert for Spotted Lanternfly" posted earlier this week on June 5). The image above shows sprouted seedlings rather than a rhizomatous colony; a reminder that mature tree of heaven is a prolific seed producer. The webworms are the larval (caterpillar) stage of a beautiful ermine moth (Family Yponomeutidae). In my opinion, this is one of the most beautiful moths found in Ohio. Multiple overlapping generations occur each season so it is common to find both moths and caterpillars active at the same time. Both are active throughout the season with the moths appearing on both early and late-blooming plants. 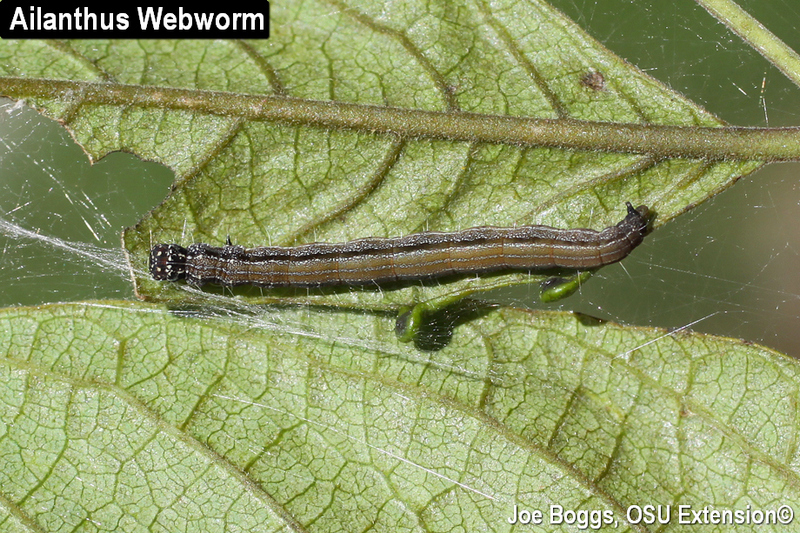 The webworms produce communal nests by pulling leaflets into a network of loose webbing. Several caterpillars live within the nests consuming the leaflets enveloped in their webbing. The webworms can grow up to 1 - 1 1/2" long and they have a wide, light greenish‑brown stripe down their backs and several thin, alternating white and olive green stripes along their sides. The caterpillars are sparsely covered with short, erect hairs, which help to suspend them within the webbing. When disturbed, the caterpillars move backwards out of the nest and drop towards the ground on strands of silk. Ailanthus webworms are native to tropical regions in Central and South America where the caterpillars feed on native trees in the genus Simarouba (family Simaroubaceae). The moth was originally assigned the scientific name, Atteva punctella, and it was observed that this moth had expanded its palate to take advantage of the non-native tree of heaven that was flourishing in Central and South America. It was once assumed the moths exploited the ever-expanding range of tree of heaven to move north into the U.S. and Canada. However, research involving DNA bar-coding, moth morphology, and food plant records eventually revealed that while A. punctella and A. aurea co-inhabit tropical regions of the New World, the moth in the U.S. and Canada is in fact A. aurea. The caterpillars are capable of defoliating their odoriferous namesake host and they may feed on stem tissue once all leaves are devoured. Unfortunately, such extreme damage is rare on large trees. Although feeding by this webworm has yet to halt the spread of tree of heaven, hope springs eternal since this is one of only a few insects known to infest this encroaching interloper.